Add the stock and milk to a large pot over medium heat and season with salt and pepper, to taste. Heat until almost simmering to maintain a temperature of approximately 180°F. Meanwhile, divide the green onion and cilantro between 4 serving bowls. 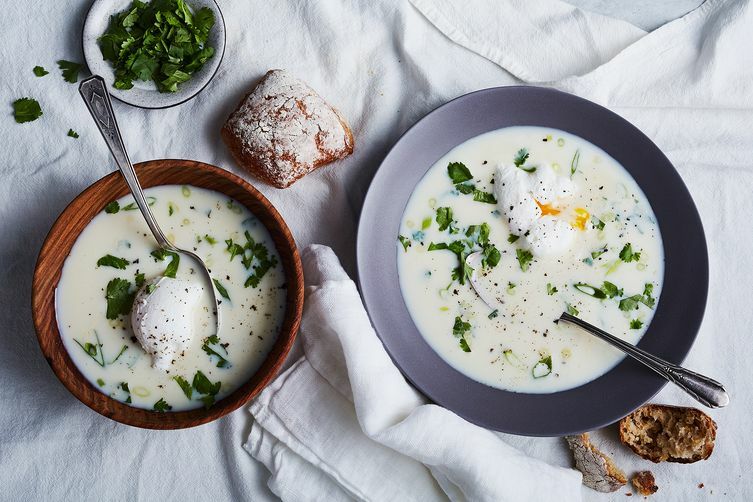 To assemble the soup: place one poached egg in each bowl, on top of the green onions and cilantro. Ladle broth over the top, dividing it evenly. Sprinkle with additional salt and cracked pepper, as needed. Serve immediately with a slice of bread, either plain or toasted, in the soup or beside it. IF PREPARING THE EGGS AHEAD: Poach the eggs in water, instead of the broth/milk mixture. When cooked to desired doneness (about 3 to 4 minutes), remove and place in ice water. Store in refrigerator until meal time. Right before serving, slip the poached eggs in the hot broth to reheat. Just for one minute. Then continue with step 4 above.